Another month has flown by here at the museum! 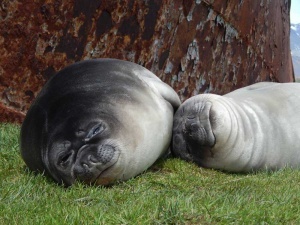 The elephant seal (ellie) pups are getting fatter, the fur seals have been arriving, and we’ve been busier than ever! As the Curatorial Intern this year, I have spent my first two months here tackling my ‘To-Do’ list for the season. This includes a huge range of tasks, so here are just some of the highlights of what I’ve been up to. I kicked off this month by installing a new display, designed by last season’s curator, in our Fullerton Room. The display focusses on the time Shackleton spent on South Georgia en-route to the peninsula at the start of the Endurance expedition. Rachel, one of the museum assistants, kindly gave me a crash course in using power tools and before long we had all the panels on the wall, and the original Shackleton’s grave memorials re-arranged. 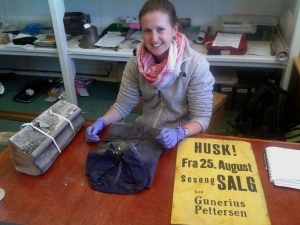 As it is the centenary of the Endurance expedition this year, we aren’t stopping at a new display and will soon be offering a brand new tour around Grytviken, all about the time Shackleton spent here en route to his various trips to the Antarctic. There have also been changes in the Carr Maritime Gallery. After the arrival of our lovely new climate controlled case last month, we found ourselves with an additional case so I have been using that to create a display about the Shackleton Epic Expedition in the Carr Maritime Gallery. This expedition, led by Tim Jarvis, took place in 2013 and recreated Shackleton’s crossing to South Georgia in the James Caird, and his traverse of the island to Stromness Whaling Station. We are very lucky to have in the collection examples of some of the replica clothing and tools they used during the expedition, and these formed the centre of the new display. This display won’t be around for too long, however, as this month I also started research for the brand new exhibition which will go into the Carr Maritime Gallery in February or March next year. It will focus on the famous ships we have around Grytviken, from our catchers, Albatros, Dias and Petrel, to Larsen’s ship, the Louise. I’ve already enjoyed learning all about them and was actually lucky enough to have the opportunity to go on board Dias two weeks ago, while there were two surveyors here carrying out an inspection of her. I was given a guided tour and even had the opportunity to go below decks and see the mess room. It was under a foot of water, however, and although I was wearing new wellies, I soon discovered that they had a leak! One soggy foot was absolutely worth it though as Dias is a beautiful ship and it was very special to be allowed to see around her. As well as all the behind the scenes work, we are now in full swing with cruise ships, and for me this meant leading my first whaling station tour. 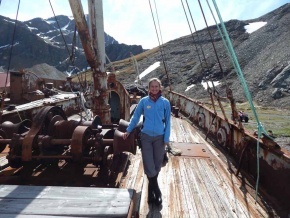 It has now become one of my favourite jobs as they are a great opportunity to get out around the whaling station and also a chance to meet lots of interesting people. On Saturday 29th November we had a particularly special ship in, carrying many relatives of the original Endurance expedition crew. A memorial service in honour of the occasion was held in the church, followed by a toast to ‘The Boss’ at the cemetery, which was a real privilege to attend. As well as all the expected tasks, there have been a few extra little surprises this month as well. Behind the museum, the builders are currently working on the old company store, or ‘Slop Chest’. During these works they have discovered some very exciting items which had fallen in between the walls. Not only did they find an account book for the Slop Chest, which dates from 1917-20, but also a blue shirt, still nicely folded for display and with its label attached! We hope that these items will go on display in the new exhibition space in the Slop Chest once the work is finished there, but first I will be carrying out some serious object cleaning as they are a little bit dusty! As we head towards to December, it looks like there will be plenty to keep us all busy. There is a deep clean of the museum to start, lots of new objects to accession and many more cruise ships heading our way, especially over Christmas when we are likely to see thirteen ships in in the one week! This page was last modified 17:50, 5 December 2014. This page has been accessed 5,856 times.